Where in The Earth Do Diamonds Form? One of the most frequent questions here at NYCWD from our treasured clients is, ‘Where exactly in the earth do Diamonds most frequently form?’ Here is a clear and concise explanation from The London Collage of Fashion’s Jacob Emily. Enjoy! All of Earth’s minerals found in present-day mining formed from the primordial soup that was once our slowly cooling planet. 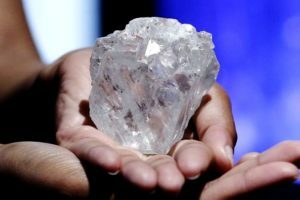 As the minerals formed into distinct types, they were pushed up through openings in the Earth’s newly forming crust, leaving a “pipe” (trail) that, even if faint to the untrained eye, points to the highest concentrations of a given mineral — in this case diamonds. Over time, glaciations, earth movement and volcanic activity may have broken and scattered the pipes, but they are not lost to diamond miners. Diamonds of value do not form within Earth’s magma, but rather deeper in the earth under greater pressure. However, diamonds do form in mineral crystal deposits found in igneous rock. This rock is in the upper mantle of the Earth’s crust, and crystallizes with the help of minerals known as peridotites and eclogites under specific temperature and pressure conditions. Diamonds are most abundant in stable layers of the Earth’s crust called cratons, and are usually found in cratons that are at least 570 million years old.